Seabirds caked in oil spilled from tankers, unable to fly, pathetic victims of the modern day need for oil, seemed to be a sadly frequent sight in the last century. 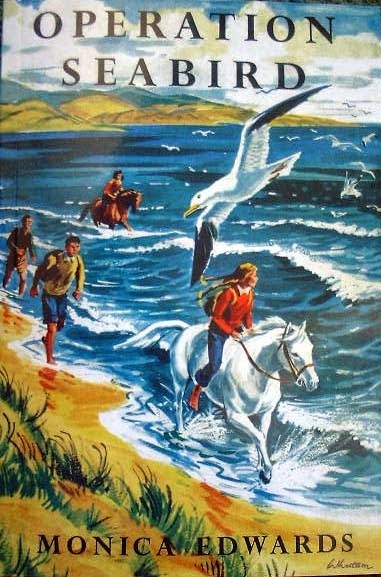 The foursome in Operation Seabird (1957) form the Seabirds Rescue League, and start an operation to clean up the many birds they find on the shoreline. Apologies for the remarkable shortness of this: time pressures obtruding again. No Entry (1954)is another Monica Edwards title that was based on real-life events. Foot and mouth disease, then as now, was a disaster when it occurred because of the effect it had on the animal as a producer. There was no treatment, and the only preventative measure was wholesale slaughter and isolation. When the Merrows' farm is threatened by a nearby outbreak, the Romney Marsh foursome take it on themselves to patrol the borders and keep out anyone who might bring the disease and threaten the Merrows' entire livelihood. 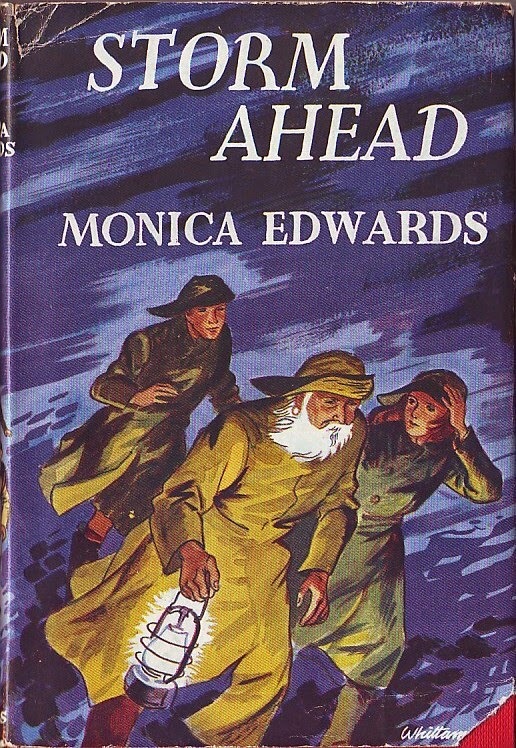 Cargo of Horses (1951) is one of the few of Monica Edwards' books to have ponies at its centre. (The others, in case you're wondering, are Wish for a Pony, No Mistaking Corker, The Midnight Horse, The White Riders and Rennie Goes Riding). In Cargo of Horses Tamzin learns that horses are being shipped off the coast illicitly to be used in the French horsemeat trade. She decides to rescue them, and with the help of Jim Decks and other sailors, Tamzin and her friends transfer the horses to Jim’s trawler, transport them to land and find them new owners. Apologies for whizzing back to the Punchbowl series - I keep all the PBOTD titles on a spreadsheet so I can make sure I don't duplicate things. What I'd forgotten was that I'd already featured Helen Griffiths' The Wild One, which is of course a totally different book from Monica Edwards'. So, here's The Wild One, last of the Punchbowl series. For years it was a horribly difficult book to find, until GGB brought out a paperback edition. Copies sold for upwards of £300. Having rounded up all the Punchbowl Farm books, I'm now turning my attentions to the Romney Marsh series books which I haven't yet featured. Today's book is The Midnight Horse (1949). This is one of the most pony-orientated of Monica Edwards' books. It was the fourth book she wrote, and was the last one of hers to be illustrated by Anne Bullen. Rissa, Tamzin and Meryon become involved in the hunt for a stolen racehorse. This is a good and exciting plot, but for me the huge attraction of this book was Tamzin's ability to sculpt model horses out of plasticene. I was absolutely fascinated by this. I am not one who reads and who sees the scenes described in her mind's eye, but I did see these horses. I longed to have Tamzin's ability, and read and re-read the book, almost as if the more times I read it, the more likely it would be that her ability would magically transfer itself to me. Fire in the Punchbowl (1965) is another book in which the Romney Marsh characters are present. In this one, Rissa and Roger are staying. Having firmly slapped Andrea away from Meryon, Monica Edwards allows the other Punchbowl characters a bit more leeway when it comes to romance, because Rissa and Roger are shown to have feelings for Dion and Lindsay. It's all terribly neat, pairing them off with each other, but that shouldn't distract from the rattling good story that is Fire in the Punchbowl. It's a terrifying read - I actually found it more so reading it as an adult, when how very close they come to disaster was much clearer to me. In many children's books, danger is actually a controllable force, or at least one that's never life-threatening. Monica Edwards didn't shy away from the difficult, and Fire in the Punchbowl, is, for me, nearly as nerve shredding a read as Arthur Ransome's We Didn't Mean to Go to Sea. Disaster is only just averted. The first few books of the Punchbowl Farm are domestic in scale: much more so than the Romney Marsh series. Initially, we are interested in seeing the family struggle with the dilemmas of farming; breeding cows; coping with fences they can’t afford to mend and the resultant escaping animals; and harvest. As the series progresses, however, the plots become more dramatic. Frenchman's Secret (1956) is a particularly good example of this. A new family move into the nearby mill, and the Thorntons befriend them. Lindsay finds an old map which suggests there is treasure hidden in the old dam above the mill. Roy, one of the mill children, decides that blowing a small hole in the dam should help them find it. The resulting flood is both thrilling and terrifying as the family retreat further and further up the mill to escape the floodwaters. Spirit of Punchbowl Farm (1952) was one of the books that eluded during my childhood - I only managed to track it down about ten years ago. It carries on Monica Edwards' mixture of stern realism, and the clash between different approaches to the countryside as embodied by Dion and Lindsay, but it mixes fantasy with all this. When you farm land, it's difficult not to be aware of all the people who have looked after it before you, and this connection of the past is brought into the present through the Punchbowl characters experiencing time slips. It's as if the past is always there, but only very occasionally do events in the current world allow us to see it. Throughout the Jinny series, we've seen Jinny wrestle with the nature of possession. Her deepest, darkest fear is that Shantih will be taken away from her. She's never felt secure in her possession of her horse. At the opening of Jump for the Moon, Jinny has learned that the circus from where Shantih came is due back. Worse, the ring master was interviewed on the radio, and has said he wants Shantih. Desperate to avoid coming across the circus wagons returning to Inverburgh, Jinny rides Shantih back to Finmory along the main road. In a dreadful irony, it's through this decision that she exposes herself to the very real possibility of Shantih going, because she's seen from a bus by a man who recognises her as Wildfire, stolen from her breeder years ago. And they track Jinny down.